Doug Johns endorses these fine companies because he uses their products out on the road and in the studio. Doug is grateful for their support and especially for the quality equipment they make. 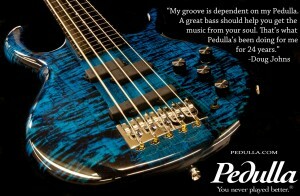 Doug has been playing Pedulla basses for more than 30 years. Doug’s main bass is a 1986 Pedulla Buzz Bass with frets put in it by Mike Pedulla himself. 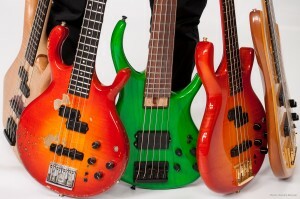 Doug uses stock Bartolini pickups with a Bartolini TMB preamp installed. Doug’s “other bass” is another 1986 Pedulla Buzz Bass with frets installed. Basically an exact duplicate of his main Pedulla instrument… 130 serial numbers away from the first Buzz Bass he bought. Doug uses Genzler Amplification. 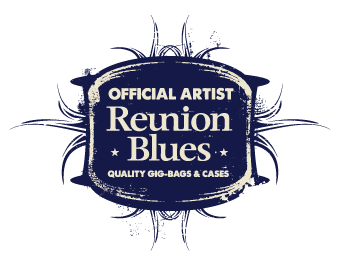 Doug is currently touring with his 800-watt, 6.25 pound Genzler Amplification Magellan. Cabs: One 4 ohm Magellan 212T and one 8 ohm Magellan 112T, Or, two 4ohm 212T’s. Doug’s Fodera Monarch 6 is used primarily for recording, but occasionally shows up at live performances. Doug uses the Dunlop Q95 wah wah, Envelope Filter, and Bass Fuzz Deluxe, Octaver, and Bass Chorus Deluxe.